Earlier this week I wrote a rather exhaustive piece on Asylum of the Daleks. After I posted it, a film maker friend of mine emailed me on a point of detail regarding my thumbnail description of the Dalek’s origins within Doctor Who’s canon. Knowing my friend to be a Whovian of the first order I set about reviewing my source material, the 1975 Doctor Who serial Genesis of the Daleks. Though the Daleks had existed as the Doctor’s foes long before this twelfth season plot arc, it was in this particular story that Dalek creator and Doctor Who writer Terry Nation, who later went on to define British dystopia with the subversive series Blakes 7, detailed the specific origins of the Dalek race. Dalek history begins on the planet Skaro. Once a technologically advanced world, Skaro at the time of the Daleks’ creation was in a state of ecological collapse and technological decay due to a thousand year war between two rival humanoid nations, the Kaleds and the Thals. The course of the war saw both sides deploy atomic as well as chemical weapons, thus rendering Skaro’s surface nearly lifeless. Moreover, prolonged attrition cost both sides much of their advanced technology, forcing the Thals and the Kaleds to adopt firearms, akin to those used on twentieth century Earth, as a primary weapon of warfare. The survivors of the war lived in two giant domed cities. Only “mutos”, Kaleds and Thals whose genetic code had been damaged from radioactive and chemical fallout lived outside the cities. 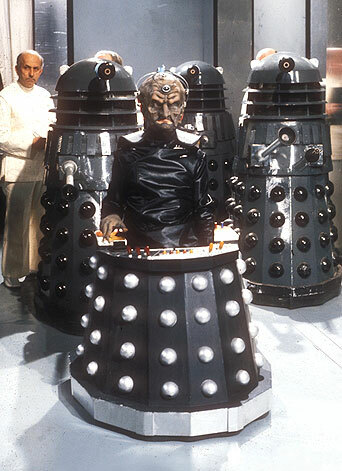 Davros was the chief scientist of the Kaled “Elite”. The Elite was a scientific and military enclave housed in a bunker outside of the Kaled city. They existed beyond the direct control of the Kaled civilian authority, and while charged with producing research and technological developments that would end the war with the Thals, their purpose was usurped by Davros. In studying the Mutos, Davros came to understand that the humanoid inhabitants of Skaro had a further evolutionary form. Therein he created project Dalek, a combat and life support vehicle that would house the Kaleds once they had fully evolved into their “ultimate form.” Davros, however, was unwilling to trust to evolution. He began experiments on healthy Kaleds, exposing them to radiation so that he might artificially evolve his race. Many of these experiments were monstrous failures, condemned to live out their tortured lives in the caves under the Kaled city. Ultimately, Davros’ twisted scientific genius proved successful in creating the “final evolution” of the Kaled/Thal race. In that sense, the first ever Daleks were direct genetic inheritors of the humanoid inhabitants of Skaro. Encased in the travel machines, the mutated Kaleds were psychological unstable, but bound to obedience by invasive programming which limited their autonomy. Davros would not stop his work there. He wanted to further improve on the Dalek race. He set about a series of genetic alterations that would remove remorse, pity, and conscience from the Dalek psyche. Their lone motivating force would be survival at any cost. When intervention from the Doctor introduced Davros to the knowledge that there was other intelligent life in the universe, he conceived of the Daleks as a twisted weapon of peace. In suppressing all others races known to creation, the Daleks would enforce peace through extermination. Upon learning of Davros’ intention to augment the Daleks, many members of the Kaled Elite, as well as the Kaled civilian government moved to end the project. While even those who opposed Davros were resigned to the knowledge that the Kaled/Thal race would evolve into a form utterly inhuman, they insisted that their final evolutionary form retain the concepts of right and wrong. Despite their objections, Davros remained utterly committed to his vision of a Dalek future. He conspired with the Thals to have the Kaled city destroyed in a missile attack. In the immediate aftermath of that strike, Davros turned his first batch of twenty augmented Daleks against the Thal city. Only a handful of survivors managed to escape extermination at the hands of the Daleks. Davros’ only miscalculation was assuming that the Daleks would remain loyal to him. 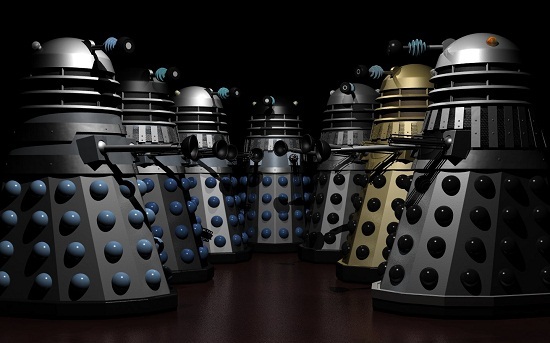 As Davros moved to consolidate power, the Daleks refused to acknowledge his dominion as their rightful leader. During this insurrection, the Doctor destroyed the hatchery that housed the twisted infant Daleks. However the automated production facilities for breeding more Daleks, as well as their shells, remained intact. Despite Thal survivors entombing the Daleks within the Kaled Elite’s bunker, the Daleks possessed all the knowledge and manufacturing capacity to perpetuate themselves and eventually leave the confines of Skaro. Their reproductive blueprint would be Davros’ augmented and evolved Kaled, their mandate: extermination. While subsequent Daleks, prior to the end of the Last Great Time War, would share a genetic heritage to the Thals and Kaleds of Skaro, they are first and foremost a product of Davros’ genetic manipulation and warped psychology. Though the Kaleds were a militaristic nation, the pure hatred that embodies the Dalek subspecies was not a trait shared by all Kaleds. Indeed, the Kaleds who died in the first Dalek purge stand as proof that there was a redemptive quality to the Kaled people. Therefore, the origins of the Dalek race must begin and end at Davros. While the Kaleds and Thals were both genetically bound to evolve into a squid-like form of life, it is only through Davros’ genetic manipulation that they became the enemy of all life within the Doctor Who universe.